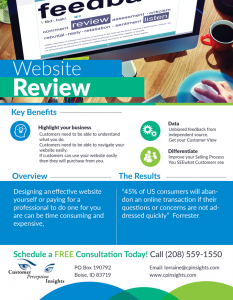 If customers can use your website easily then they will purchase from you. Unbiased feedback from an independent source. Beat your competition. Grow your business by understanding how to attract customers that are going elsewhere. Stats. “45% of US consumers will abandon an online transaction if their questions or concerns are not addressed quickly” Forrester.